1893-1977. John Nash was primarily a landscape painter. He had a great love for nature, and concentrated on painting natural subjects throughout his career. Nash was the brother of Paul Nash, a more celebrated artist, but Paul encouraged and supported John throughout his life. Nash knew most of the innovative modernist artists in the 1910s, 20s and 30s, but his style remained constant throughout his life. He was also a prolific book illustrator, producing botanical drawings. 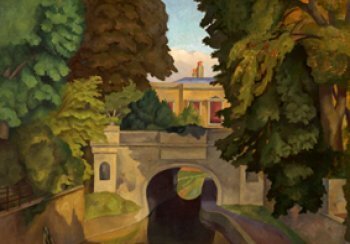 He visited Bath in the mid 1920s and painted several views of the city. Nash painted few urban scenes and even these views show the outskirts of the city, where it is close to nature.